As part of my most recent blog redesign, I added a number of static pages which contain some of my most popular posts, my work history, disclosure badges and event history. Since then, Blogger revamped its publishing back-end, mirroring the design upgrade also seen at Gmail and Google Calendar, as Google extends its recent efforts to enhance the user experience. Somewhere in that mix, I overlooked the added capability to make these static pages not require native content on the blog, as they can also link to external sites. This option was pointed out by George Moga today on his blog, and I've already gone ahead and leveraged his tip. If you are a Blogger user like I am, you can modify your blog template to include this feature by going to draft.blogger.com. 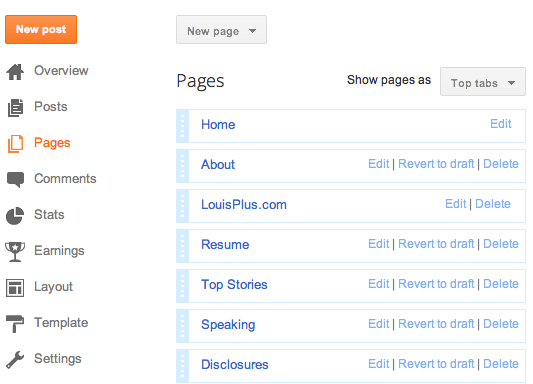 Select "Pages" from your blog's overview section, and then hit "New Page" to make a new page, hosted or linked. There are two options - the first being a "Blank Page" for your own content, and "Web address" for the link itself. Simple. My List of Static Pages on Blogger, Now With LouisPlus.com. Recently, I acquired the domain name LouisPlus.com for my Google+ content. To be honest, my good friend Drew Olanoff (who also owns DrewPlus.com) bought it, but he promises he'll let me use it. :) In addition to the Google+ icon in my left sidebar, I've now added a link to LouisPlus.com in the header of my blog, thanks to this new redirect feature. So if you're somebody who wants to link to "My Company", or a social network of your choosing, or really anywhere, it's very simple. No hacking needed.